Built: 13th century with additions. Ownership / Access: National Trust for Scotland. Opening Times: Open to tourists during the summer months. Notes: Fyvie Castle is a castle in the village of Fyvie, near Turriff in Aberdeenshire, Scotland. The castle (like many places in Scotland) is said to be haunted. A story is told that in 1920 during renovation work the skeleton of a woman was discovered behind a bedroom wall. On the day the remains were laid to rest in Fyvie cemetery, the castle residents started to be plagued by strange noises and unexplained happenings. Fearing he had offended the dead woman, the Laird of the castle had the skeleton exhumed and replaced behind the bedroom wall, at which point the haunting ceased. It is said that there is a secret room in the south-west corner of the castle that must remain sealed, lest anyone entering meet with disaster. It's not clear if this is the same room in which the skeleton was found. There is also an indelible blood stain, two ghosts and two curses associated with this place. One of the curses has been attributed to the prophetic laird, Thomas the Rhymer. 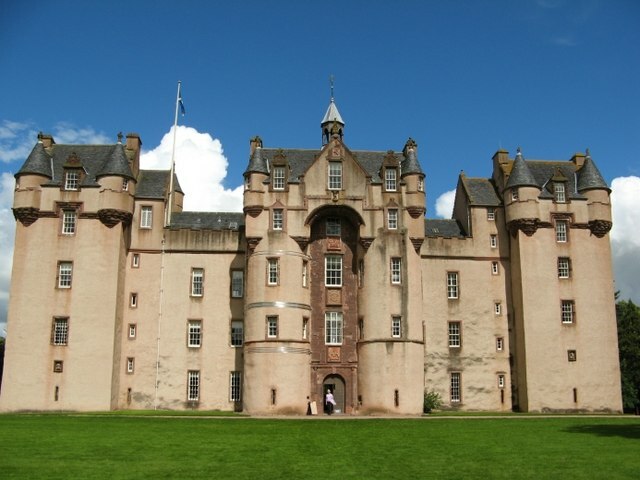 Fyvie Castle has featured in a number of British television programmes, such as Living TV's Most Haunted season 6. and stv's Castles of Scotland. The castle also played host of the setting of a children's gameshow on CBBC called Spook Squad in 2004. 2009 saw the publication of the children's fantasy novel, The Time-Tailor and the Fyvie Castle Witch Trials, written by Deborah Leslie. In recent years, the castle grounds have hosted an annual Fyvie Live music festival in August, which was headlined in 2011 by Beverley Knight and in 2012 by Sophie Ellis Bextor. Another annual event was a 5K fun run around the grounds and adjacent loch, held in April, however both of these events were discontinued in 2013.